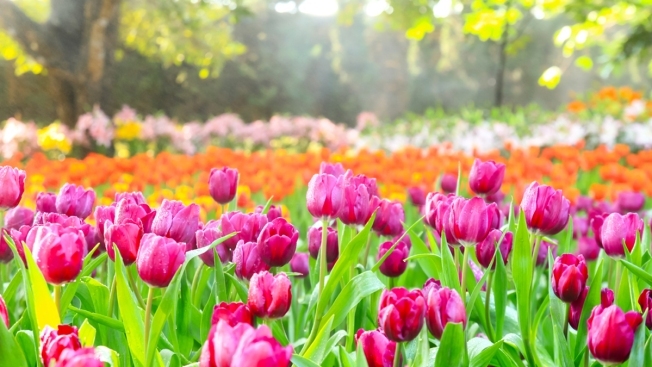 A land of 240,000 tulips in bloom is a land we'd like to visit. Luckily, Longwood Gardens expects their tulips to stick around until late May -- so we still have plenty of time to hit the road. Longwood Gardens will have thousands of their ever-popular tulips will be on view through May 31 during spring bloom. If you go soon, you'll also be able to scope Easter lilies, pink foxgloves, blue hydrangeas and a pink tower of jewels. If you visit later on, a must-see is the new Meadow Garden, featuring 86 acres of vast wetland, blooming wildflowers, four learning pavilions and three miles of hiking and walking trails. It's an ideal location to relax and unwind with nature as your backdrop. Longwood Gardens (1001 Longwood Road, Kennett Square, Pennsylvania) is located about two and half hours from downtown D.C.